DoubleTree by Hilton Grand Junction is inviting couples to get married in Grand Junction this year! The DoubleTree is offering couples looking to get married between August 2016 and December 2016, a great promotion- complimentary ceremony venue with purchase of a dinner reception package. This promotion is valued at hundreds of dollars! Couples looking to book this great promotion should call Kimberly Alderman, Catering Sales Manager, at (970) 263-8156 as soon as possible to take advantage of this great offer! 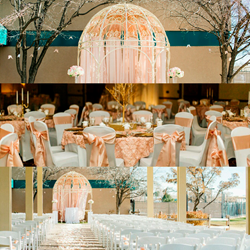 With 13,000 square feet of flexible event space, DoubleTree by Hilton Grand Junction is the ideal venue for any wedding, event and celebration in Western Colorado. Experienced meeting planners will take care of every detail while the professional catering team creates delectable fare to please even the most discriminating of palates. For the finest among Grand Junction hotels and venue space in the heart of Grand Junction, book your event and stay with the DoubleTree by Hilton Grand Junction. For more information on the DoubleTree by Hilton Grand Junction, please visit http://www.doubletreegrandjunction.com or call (970) 241- 8888. DoubleTree by Hilton Grand Junction is proudly managed by Stonebridge Companies in Denver, Colo. Founded in 1991 by Navin C. Dimond, Stonebridge Companies is a privately owned, innovative hotel owner, operator and developer headquartered near Denver. Its diverse listing of properties includes select-service, extended-stay, mid-scale and full-service hotels in markets throughout the U.S. For detailed information, visit http://www.sbcos.com.